Medino is a free HTML5 Bootstrap 4 medicine website template. It is chock-full of up-to-the-minute features and assets namely, Hero header, sticky navigation, drop-down menu, call-to-action button, appointment form UI, Instagram feed to name a few. Medino is a free HTML5 Bootstrap 4 medicine website template. 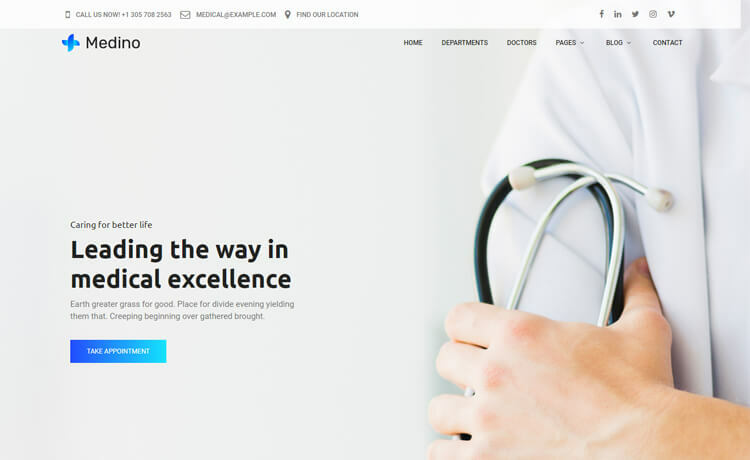 It is a fully responsive theme best suitable for clinics, hospital, doctors, dentists and other medical professionals and institution’s websites. Moreover, Medino is a simple and minimal theme with an eye-catching gradient style design. It is a multi-page theme and optimized for several browsers. Besides, Medino is chock-full of up-to-the-minute features and assets namely, hero header, sticky navigation, drop-down menu, call-to-action button, appointment form UI, Instagram feed to name a few. On top of that, easily customizable code and well-organized plugins are packed in the box with it. Creating with Medino is as smooth as a knife through butter! Thank you for downloading Medino.